Enjoy our charming home with 100 feet of quiet Basford Lake frontage and access to all sports Big Star Lake 100 yards away. 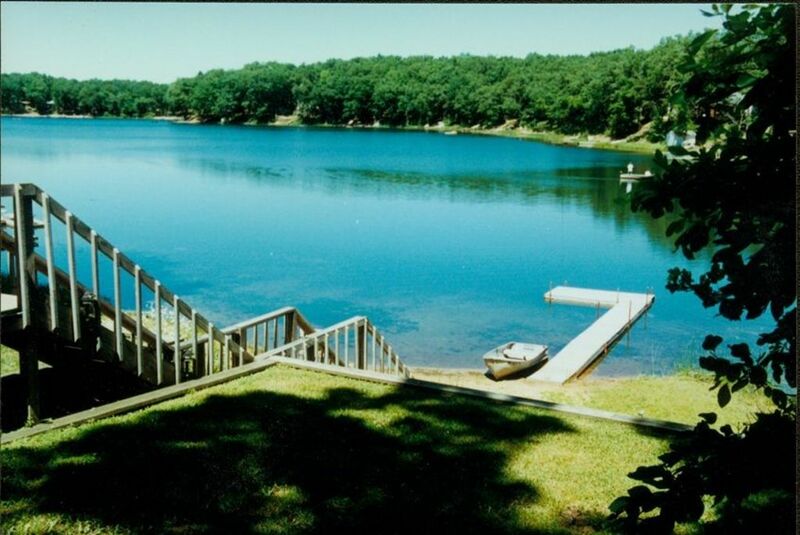 Our house offers beautiful views of Basford Lake, large detached deck, sandy beach and paddle boat for your use. We have exceptionally big lot with parking spots for multiple cars and boats. We are located 2 Mi from public golf course and restaurant, 3 Mi from North Country Hiking Trail, 5 Mi from scenic Pere-Marquette river with canoe, kayak, tube rentals. In the area you can find 2 stores with complete line of sport fishing equipment, woodworking museum, free Saturday evening jazz and blue grass music in the park, grocery stores, movie rentals and famous ice cream store. Parking for RV/Boat/Trailer; Minimum Age Limit for Renters. We stayed at this beach house for 3 days. The house was nice but it could be more pleasant with a little maintenance and a landscape grooming. It was a very friendly community and we liked chatting with our next door neighbor. Thunderstorm hit the area 3 days prior to our visit and there was no electricity in the neighborhood when we arrived the house at night. We learnt the news from the next door neighbor in the morning. It wasn't very pleasant to spend the night and day with no electricity and water, but thankfully city workers fixed it the other night so that we were relieved. We mentioned that to the owner Kris and he paid us back the first night's stay which we appreciated. No wifi and no data connection in the area so we may want to leave your phones in your packets and get into nature. Cottage clean with many amenities. Kids had fun in the water and on paddleboat .So peaceful taking time to read a book on the deck overlooking the lake and listening to the loons. Lake community very friendly. Owner responsive to our questions even after our arrival. Two thumbs up! The house was nice but needs some TLC. The outside needs some powerwashing and landscape grooming. For lakefront rental we were putside and it could be more pleasant with a little maintenance. The main area of the house was nice for everyone to hang out. Owner very easy to work with. Friendly community. The house fit our needs perfectly. The little ones had a blast playing in the water which was super warm. Plenty of room for everyone, spent evenings enjoying bonfires with no mosquitos. It was a great vacation thank you. Had a wonderful time on the lake. House is very spacious and had a lot of extras to make your vacation special. Best part was dealing with the owner of the property, as he was very responsive and helpful during the booking process! Amazing experience!